Marinated Chicken Tomato Orzo Salad. Wow, that’s a mouthful, and a good one at that. This salad is colorful, fresh, and delicious. Marinated chicken, fresh tomatoes, arugula, mini mozzarella balls, and cucumber mix with orzo pasta for a refreshing chilled salad. Topped with toasted pine nuts, crispy croutons, and fresh basil chiffonade, it’s a simple weeknight main course or a salad course depending on your guests’ appetites. Make it the night before so the flavors can intensify. Start out with two cooked or grilled chicken breasts. Dice the meat into 1/2 inch cubes. 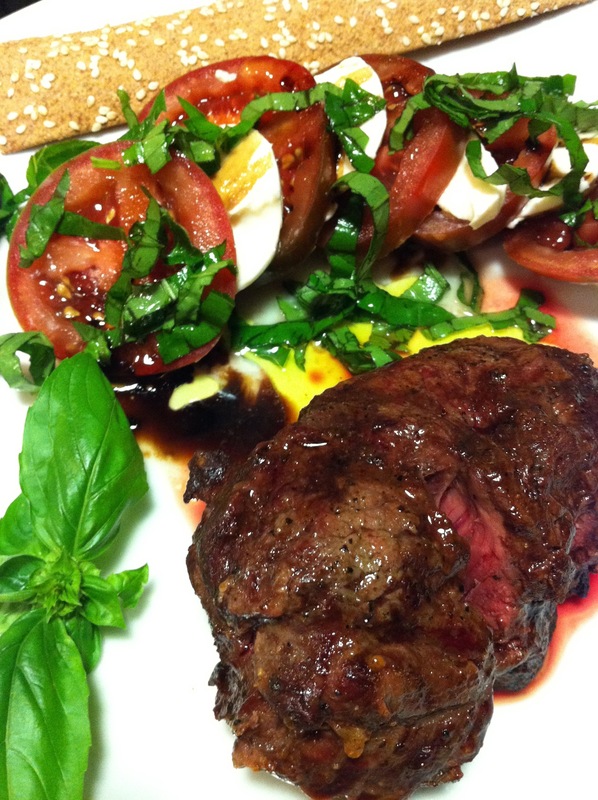 Mix together a marinade of honey, canola oil, Italian seasoning, minced garlic, white balsamic vinegar, salt and pepper. Stir the marinade into the diced chicken until the chicken is well coated. 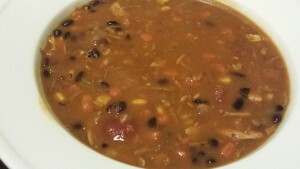 Refrigerate the diced chicken for at least an hour, stirring once in a while so it marinates well. I know you are supposed to marinate the chicken before you cook it. When using diced cooked chicken in a salad, I prefer to marinate the diced chicken AFTER it is cooked so it will absorb more of the marinade flavors. While the diced chicken is marinating in the refrigerator, cook some orzo pasta and let it cool. Stir some olive oil into the cooled pasta. 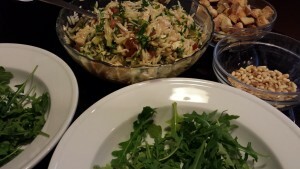 Dice some tomatoes, chop some arugula, quarter some mini mozzarella balls and mix into the orzo pasta. 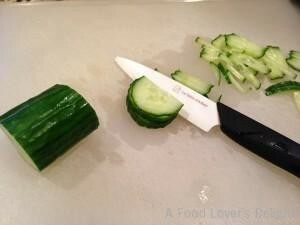 Slice some unpeeled cucumber and then slice into thin strips like a chiffonade and mix that into the orzo pasta as well. When the diced chicken has marinated for an hour, stir it into the orzo pasta mixture. Refrigerate the orzo pasta salad for at least four hours or overnight. 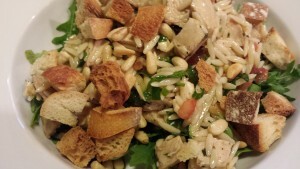 To serve the orzo salad, divide some whole arugula leaves amongst four serving plates or bowls as a bed for the orzo. 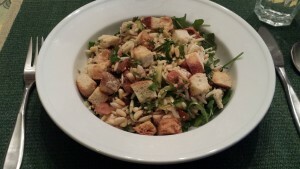 Spoon the orzo salad onto the arugula leaves. 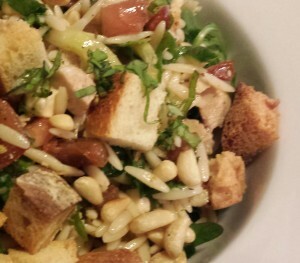 Top the orzo salad with toasted pine nuts, crispy croutons, and basil chiffonade. And serve! This salad travels well for a packed lunch or picnic. Just stir in the toasted pine nuts and basil chiffonade before chilling the salad. Package the whole arugula leaves and croutons separately in plastic bags and combine everything when ready to eat. 1. Dice the chicken breasts into 1/2 inch cubes. 2. Whisk together the honey, oil, Italian seasoning, minced garlic, white balsamic vinegar, salt and black pepper. 3. Add the marinade to the chicken cubes, mixing and coating the chicken well. 4. Refrigerate the chicken for at least an hour so the marinade soaks into the meat. 5. While the chicken is marinating, cook the orzo pasta according to the package directions. 6. When the pasta is cooked, drain and rinse with cold water. Drain well. 7. In a non-metallic bowl, mix 1/4 oil into the orzo pasta, stirring until the orzo is coated with the olive oil. 8. Add the chopped tomatoes, chopped arugula, quartered mini mozzarella balls, and cucumber chiffonade to the orzo and stir until combined. 9. After the chicken has marinated for the hour, stir it into the orzo mixture. 10. 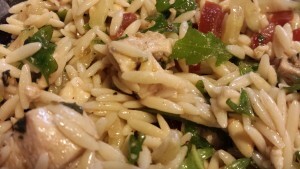 Chill the orzo salad for at least 4 hours or overnight for the flavors to enhance. 11. When ready to serve, divide the whole arugula leaves amongst 4 serving plates or bowls. 12. 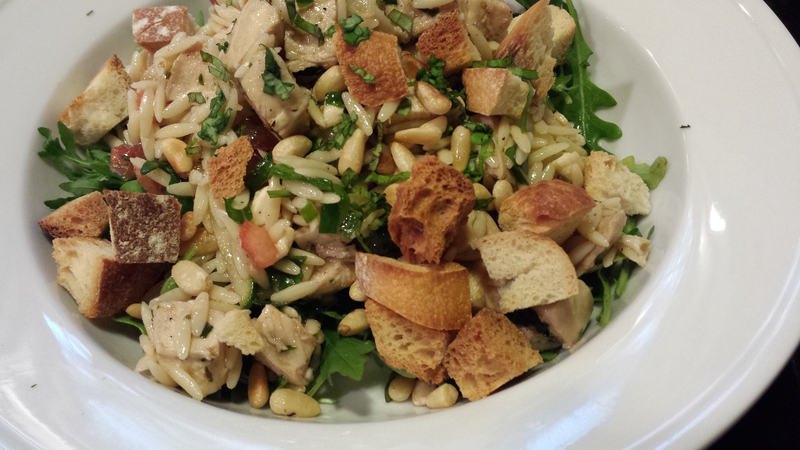 Top the arugula leaves with the orzo salad. 13. Top the salads with the pine nuts, croutons, and basil chiffonade. Use my easy crispy crouton recipe. 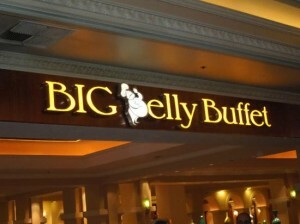 Makes 4 main course salad servings or 8 – 12 salad course servings. Offer with some toasted baguette slices that have been spread with my Garlicky White Bean Dip. 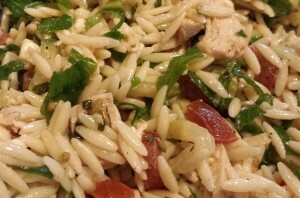 Variations: Add more basil to the orzo salad. Omit the chicken for a vegetarian dish, but use the marinade as an herby dressing for the salad. For a gluten free option, substitute quinoa for the orzo pasta and omit the croutons.